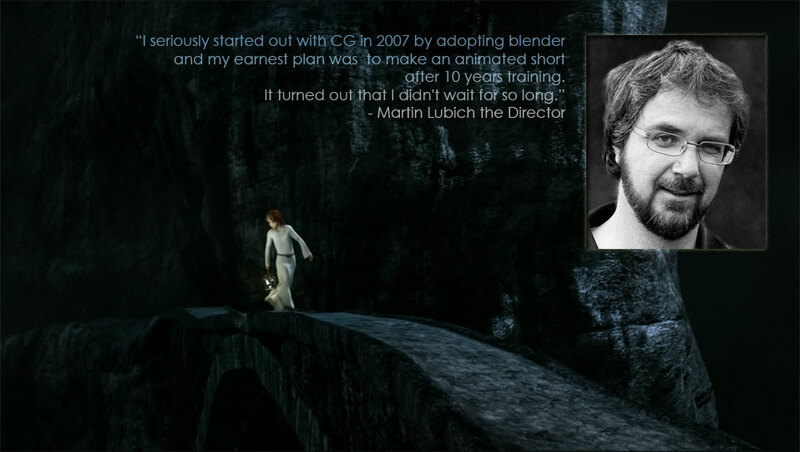 Director Martin Lubich shares his story of how he created Ara's Tale with Blender. Some of his observations may have been outdated due to some recent featured added or being added to Blender. as a production tool. - Editor in Chief. Congrats on your release of Ara's Tale. It looks fantastic! It's great to have you for our interview! So, Would you like to introduce yourself? I am a 49-year-old software developer. I live in Tyrol/Austria with my wife and two kids. I have no formal training in CG. Currently CG is done in my freetime with occasional freelance jobs. When did you start learning 3D animation? I always had a keen interest in everythng visual (movies, photography) as well as music, and in combination with my computer related profession, naturally being very attracted by all CG from the very beginnings on in the 1980's. I seriously started out with CG in 2007 by adopting blender and my earnest plan was to make an animated short after 10 years training. Has your background as a software developer helped you to learn and use Blender better? My technical background didn't exactly help me with learning blender better, but it helped tremendously in managing and organizing the whole project, like setting up the computer hardware, network, scripting, file management, and versioning tasks. Let alone using and installing various software packages on different OSes. How have you been studying 3D animation? What Blender tutorials was most helpful for your effects used in Ara's Tale? I have read a lot (like the classics The Animator Survival Kit, The Illusion of Life) and watched countless tutorials and making-ofs but also live-action videos for life reference. But I never had any official training in any CG area. For making a movie, the most helpful book was, 'Animating with Blender' by Roland Hess, which helped a lot with initial setup, organisation and planning of a movie project. For other specific areas I would say the most helpful source of information was the compositing tutorial from Sebastian König hosted on cmiVFX. 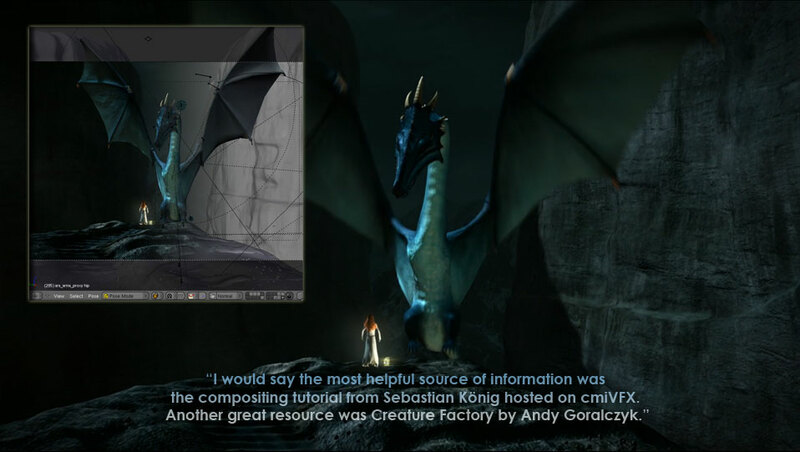 Another great resource was Creature Factory by Andy Goralczyk. What also gave me a very good start for rigging was Gordon Goodwin's Rigging Repository (http://rigging-repo.blogspot.com/) and Paul Cageggi's rigging tutorials on his blog, especially the facial rig tutorial (both seem to be down or relocated, though). What motivated you to take up the challenge of creating Ara's Tale? In the end, it boils down to the immense love I have for film. I have watched countless documentaries on DVDs, but what got me deeply motivated were the excellent making-of series bundled with the extended version of LOTR. That was, what got me started with CG, but always with the goal to produce a movie. And what helped too, was my naivety when I started out. I plainly had no idea how much work this really involved. But I was determined to pull this through. And being in touch and getting feedback from like-minded people was also essential for the motivation to stay. In times of frustration I had to take a break and step back from the project, sometmes up to one month. But the knowledge was there that this movie actually can be finished and this brought me back, always. What challenge(s) did you face while creating the short? Challenges were manifold. During such a project you face two types of challenges: technical and personal. The technical ones can very fast lead to personal ones. And there were some pivotal points durng the production, where I learned a lot of myself. The most technical challenges were the hair, cloth and especially particles. There were other challenges too, like getting the rigging right e.g., but with those I knew that the problem was with me. With cloth, hair and particles I had to face the countless shortcomings in blender which led to the abovementioned pivotal points. Now that you have been through with creating a cinematic short, how long do you think now would take to create another short with equal length and quality (or better)? I have done a detailed accounting of all the hours spent on the various tasks of the production. The total is 1,860 hrs. This equals roughly a year of fulltime work. That means doing this on a paid basis would automatically reduce the real production time. A similar movie would be much faster now, maybe half the time, if I use the approach and workflow as I have used in Ara's Tale. A lot of time was spent in doing research and building up experience, which is now there and ready to be used. But what I also learned is, that there will always be roadblocks and research, regardless of how often you have done something. But improvisation gets better the more experience you have. Also if I would start another project like this, I guess I wouldn't do this alone anymore. Having shown my seriousness with Ara's Tale should enable me to more easily find collaborators for any potential future projects. Has there been any problem or specific needs that you discovered while creating Ara's Tale that need some attention by developers of Blender? Yes! Hair, cloth (to a degree) and particles. And maybe smoke too, as this was something I dismissed completely after countless failed attempts to get what I wanted. In my point of view, these features are currently nice demo aspects, but nowhere near a good production tool. As a director you want to have full artistic control over these aspects and this is nearly not possible. And even this small amount of control comes with a huge penalty in terms of complexity and time, which defies any fast workaround cycles. And this limits your creativity to test new things and try to go for new directions. There are countless examples in Ara's Tale where coincidence shaped a shot. E.g. the shot when Ara comes out of the canyon and her hair falls over her shoulder. That was not intentionally, but I only saw it once the hair simulation was done (after 5 hours). It looked good but it was a happy coincidence. I didn't even try to plan this as it would have increased the complexity to a degree you cannot handle anymore in a predictable manner. Another area, which I found lacking was the texturing inside Blender. I now have the direct comparison between Blender and Mari on comparable assets. The environment at the beginning of the movie were textured inside Blender, whereas the other was entirely done in Mari. In the end its again ease of use, speed and available tools that slows you down for such huge assets. Doing serious highres projection painting inside Blender in an efficient way is simply not feasable. Other than Gimp, what software did you have to use and why? I used MyPaint for all of the concept work and storyboarding. This is an especially nice application and gave me the pencil-on-paper feeling I like when doing sketches. Its brush engine is simply fantastic. I used Mari for texturing the main environment and the dragon. I was generously given an extended test license from the product manager of Mari himself, who contacted me during production. Working with Mari was one of the highlights during the production. The dragon and environment wouldn't be what they are now, had I used Blender alone. For final colorgrading I used DaVinci Resolve Lite. I did various tests with Blenders sequencer and compositor, but again the speed and ease of use let me use the commercial version. You need immediate feedback when doing primary and secondary colorgrading. Primary grading can be done inside the sequencer but is very limited. Secondary color correction can be done in the compositor but with awkward setups of masks and abysmal respone time and then you still have to face the problem of combining compositor and sequencer. The newest version of Blender may be much better on these type of things though, as the Mango team now face this very problems. The music and sound effects sound fantastic! Would you like to introduce the composer and sound designer? And who else was involved in creating Ara's Tale? Oh yes, that's a huge part of the movie and really essential, both soundfx and music. Mikkel Nielsen (http://www.sonicsalute.com, http://www.imdb.com/name/nm4539836/), the sound designer for Ara's Tale came on board quite early. He contacted me after seeing my WIP on cgtalk. Mikkel is from Denmark and has done various sound work, like sound installations for a museum as well as various films and documentaries. Working with Mikkel was an immensely delightful experience. 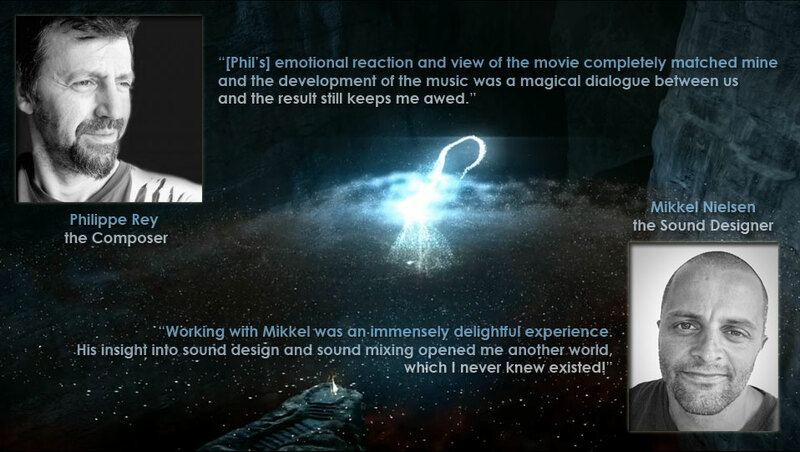 His insight into sound design and sound mixing opened me another world, which I never knew existed! He always kept watch on all the aspects of sound design and sound experience. And in the end he managed all the sfx and music with such care and always true to the movies theme. At first, I feared that his fantastic sfx work would collide with the music and tradeoffs had to be made, but sfx and music fit so well together, complementig each other, it was one of these magical moments. The sequence of the dissolving dragon is absolutely fantastic! And it was Mikkel who suggested to use a 5.1 setup for the final mix. It gives so much more depth to the whole sound experience, I really recommend viewing the movie with a proper equipment. Philippe Rey (www.phreymusic.com, http://www.imdb.com/name/nm4825215/) a French composer for movies (Devils, Angels & Dating) and games contacted me early in production and offered to write the score. I already had another composer then. But it turned out we had to end the collaboration and I came back to Phil, who had actively followed the production on my blog. I dare to say that this turn of event was a godsend for me and the film. His emotional reaction and view of the movie completely matched mine and the development of the music was a magical dialogue between us and the result still keeps me awed. There was this one moment during production when Phil delivered the part where the dragon dissolves. Watching this part with the score left me with the feeling that I was watching the movie for the very first time. I was simply awed. This will always be an unforgettable moment for me. I am really blessed to have found such talented people who offered their time for free to work on this project. Sound and music make easily up to 50% of the whole experience. Ara's song is sung by Julia Joy Schaller with her wonderful voice. She is a 12 year old singer with quite some years of professional experience in choirs. Now also training as solo singer I truly believe that she will have a bright future. I discovered her by accident, because she is the daughter of a coworker of mine and during a company dinner I mentioned my problem about finding a 12 year old soprano singer - perfect match. There are quite some plans I have, short term and long term. First, I have to clean up all the production files and assets to be published under a CC-BY license. But I have still no idea how to distribute those as they will amount to appx. 25 GB of data. Maybe, I will be at the Blender conference this year, where I have submitted a talk about the whole production of Ara's Tale. I also plan to submit the movie itself to the Suzanne Awards Festival. What I would really like to do is to create a series of tutorials/how-tos on various production aspects of the movie. What I found disappointing about the open movies so far, is that you get all the assets, but are left alone about how all these work, why things are as they are in the files and so forth. If I can show my thinking and design decision behind the assets, this should be much more helpful than the assets alone. A first glimpse of that can be found in the next Blenderart magazine, where I describe my approach and workflow of lightgroup based lighting and offline compositing with multilayer EXR files. Furher down the road, I have to get more familiar with the latest Blender features, especially the motion tracking part. During those 3 years I barely had time to dive into these new areas. Wow, that sounds great. Thank you for sharing your observations, Martin.